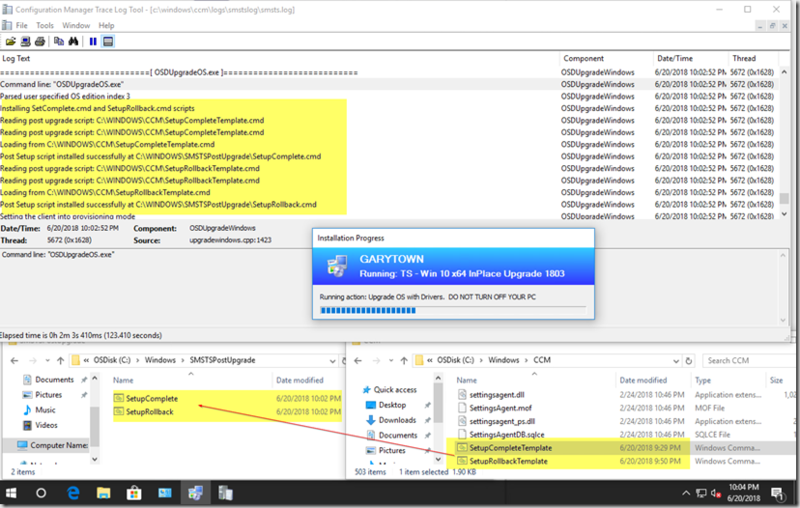 During the IPU Task Sequence, the Run OS Upgrade Step does many many things (OSDUpgradeOS.exe), like place the machine into provisioning mode, compile the command line to be used with the Windows 10 Setup Engine, and more, including, what we’ve gather here today to talk about, creating the SetupComplete.cmd and SetupRollback.cmd files. Knowing this information, we can then create our own package with those files. I’ve created a readme file with basic info (I tend to forget, which is why I blog and document). I also created Append text files for each, which contains the additional information I’ve added to each of the two command files. Why? 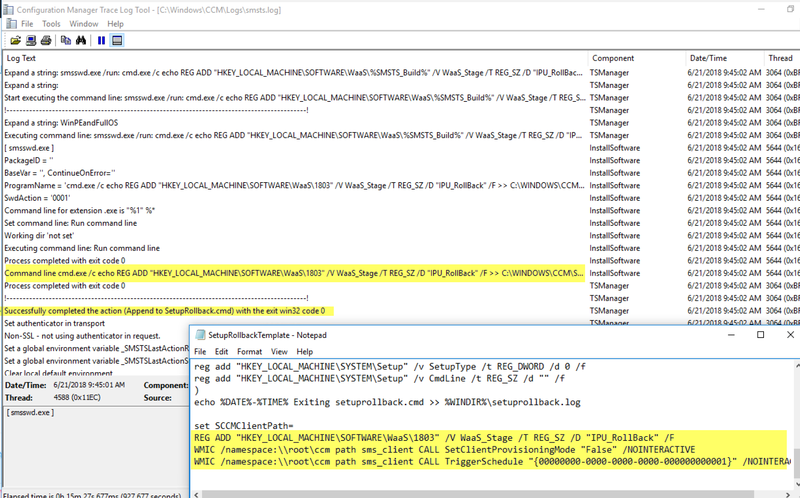 So the next time I update CM to the next Current Branch, I can grab the latest SetupCompleteTemplate.cmd and SetupRollbackTemplate.cmd files and use those. Perhaps the CM Team updated the scripts with some useful items. This way, I can just delete the 2 I have, copy the new ones over, and append my additional code to them. 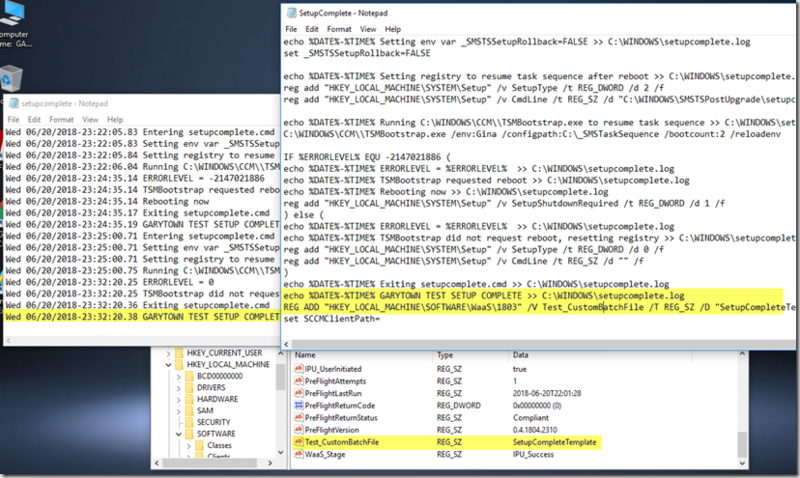 REM Setting WaaS Key Registry Key, requires %SMSTS_Build% variable in TS set. I also made a minor change in the SetupComplete.cmd, just so I could confirm this was working without having to reproduce an actual rollback. 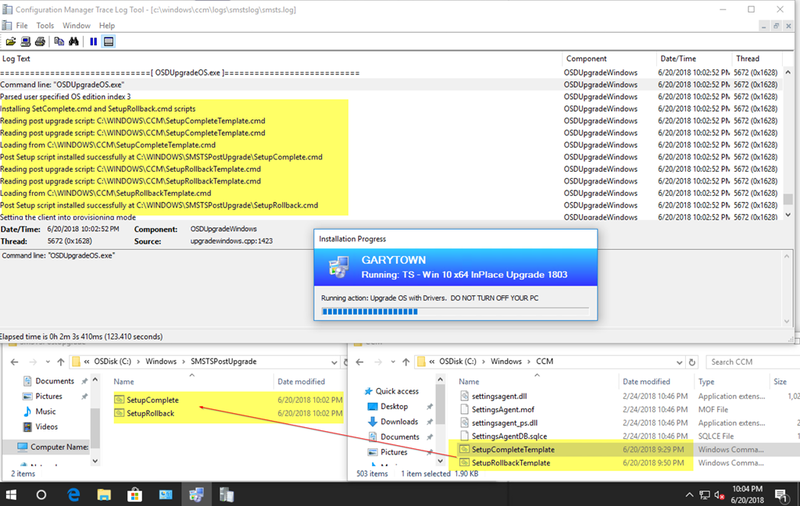 And as you can see, after the upgrade, the registry key is updated, the log file is also updated. OR... the NO Content Version. I actual prefer this, as you don't have to manage a package and keep it updated. 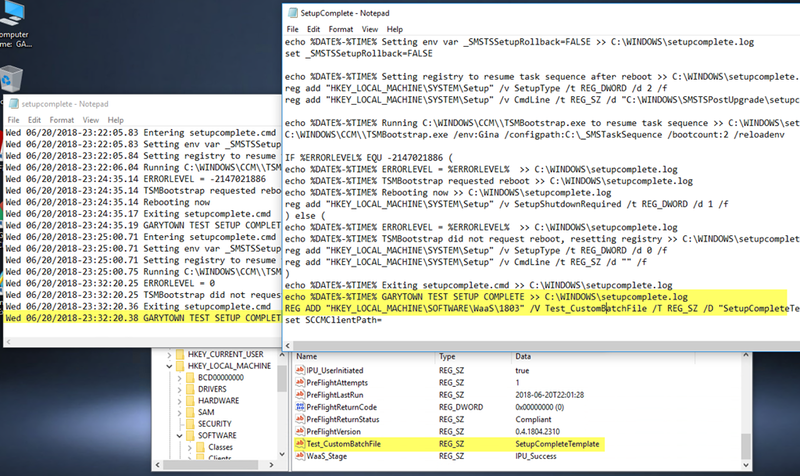 I have 2 steps in the TS, one for each .cmd file. I hope you find this interesting, if not helpful. Thanks to @MikeTerrill for showing me these files on the Server, and peeking my curiosity as I search for ways to improve the IPU process, one of which is to reduce the number of machines stuck in provisioning mode after they roll back. Hey Gary, good stuff. We do something similar for our IPU as well to handle some BitLocker scenarios and we found we had to manage two instances of the SetupCompleteTemplate.cmd file depending on the version of CM installed on the client. When we moved to the 1710 version of the client from previous versions, we had to accommodate both until all clients were upgraded as there were differences in the file between the two versions. Just something to watch out for but following your process above to simply append to the existing files no matter what version is installed would be easier and thanks for the tip! Thanks so much for the post. It’s funny, up until recently I never even heard of SetupComplete.cmd. I am working on upgrading our Win 7 & 10 computers to Win 1803 or 09. Unfortunately we use Symantec encryption. 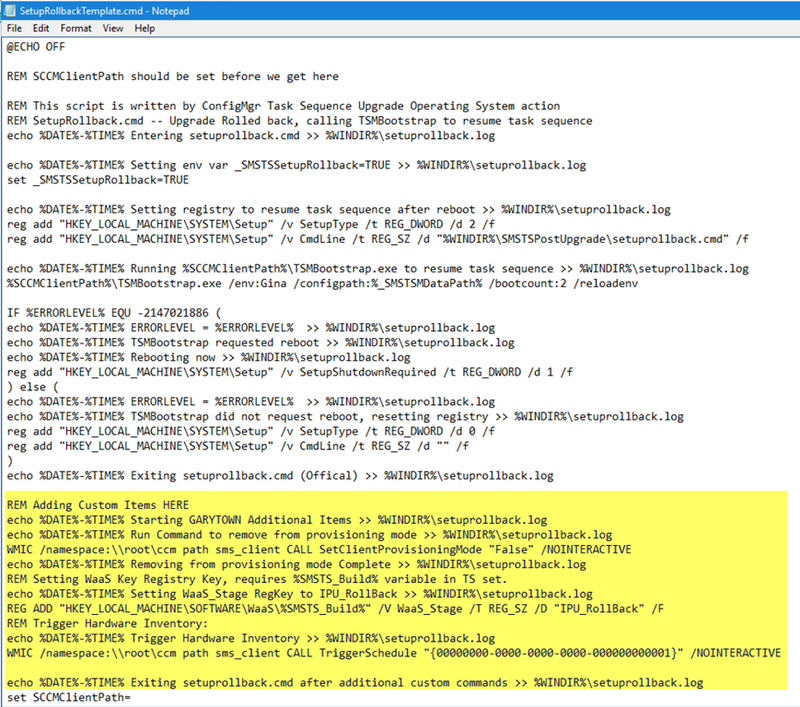 The Symantec supplied scripts are not made for SCCM, or at least, it certainly doesn’t seem like it. 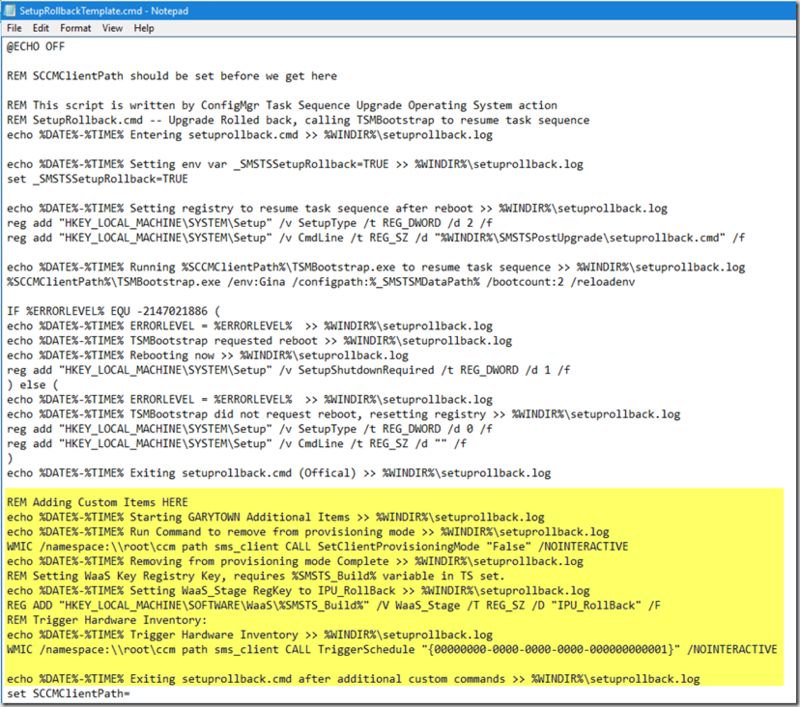 Symantec has their own SetupComplete.cmd that needs to run. This a great idea adding it to the template. Hope it works. Thanks again!